accessories in the engine bay. As a drive belt wears over time, the teeth rest in the grooves of the belt rather than on the surface. 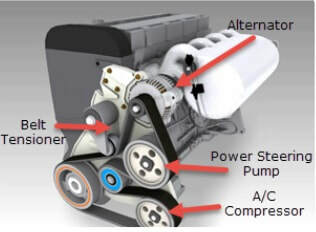 conditioning compressor. The belt tensioner puts tension on the drive belt to keep the belt in place and to create sufficient friction to turn all the pulleys on the belt system. and causes the belt to squeal. When the belt tensioner becomes weak, the belt is not wrapped tightly enough around the pulleys, potentially resulting in slipping, especially on components that require a lot of energy to rotate, such as the alternator. This can result in squealing noises and reduces accessory efficiency. parallel with the belt and other pulleys - can occur with automatic spring tensioners. The misaligned tensioner pulley puts greater pressure on a small section of the belt, which eventually causes a rib or multiple ribs to become detached from the belt. bearing which can eventually fail. A failed bearing causes the pulley to stop turning. 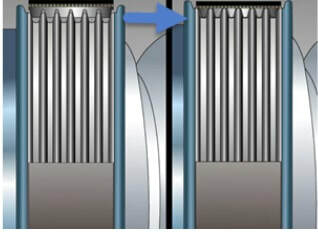 The rotating belt rubs against the seized pulley surface, generating a lot of heat and noise until the belt breaks. With a broken belt, the vehicle can become un drive able.